Intrigues not with good guy-bad guy shtick, but with the conundrum of how to live morally in an inherently immoral West. 116 min. Fox Searchlight Pictures. Director: Zal Batmanglij. Cast: Brit Marling, Alexander Skarsgård, Ellen Page, Patricia Clarkson, Shiloh Fernandez, Jason Ritter, Julia Ormond, Jamey Sheridan. Are we headed in the wrong direction? A collective called The East thinks so, and they believe corporations are taking us there, through their "worldwide terrorism." And so, with eye-for-an-eye fervor, The East commits acts of eco-terrorism against Western corporations. That's the setup for the suspense thriller The East, directed by Zal Batmanglij and co-written by Batmanglij and star Brit Marling. Marling plays Jane Owen, a fomer counter-terrorist agent for the FBI who now lends her expertise to the private sector. As an operative for the private intelligence firm Hiller Brood (headed by Patricia Clarkson's Sharon), Jane infiltrates eco-terrorist groups and gathers intelligence to share with law enforcement as they dismantle the groups, piece by piece or en masse. That's all well and good for the ambitious and devoutly Christian Jane until she gets in with The East, whose anarchism seems more and more reasoned to her the longer she spends in their company. This is a form of Stockholm Syndrome, yes, but perhaps something more as she sees the legitimate appeal of the group's intimacy and depth of belief, and the undeniable, unanswered crimes of the corporate executives they target. Also, the group's leader is kind of hot. Jane finds herself drawn to Benji (Alexander Skarsgård of True Blood), whose messianic leadership she finds magnetic, if not hypnotic. And though she has a boyfriend at home, he's kept in the dark about her work, and it's clear she's used to being a lone wolf. So the extent to which the members of the collective (including Ellen Page's Izzy) give of themselves to each other and, now, to her touches her on some deep level she struggles to understand. Is this, she has to wonder, after all I've stood for, who I am? Are these people wrong? And can I turn them in? In narrative terms, the story is cleverly built for us to notice what Jane notices, share in her questioning, and voyeuristically conspire with her. Much of the film concerns itself with productively blurring lines. An opening narration notes of corporate malfeasance, "When it's your fault, it shouldn't be so easy to sleep at night...It shouldn't be so easy to get away with murder." And so an executive who presided over an oil spill becomes the target of one of The East's missions, or "jams," in which they pump oil into his home. If you accept that poetic justice, the film asks, will you accept the next one, which goes a step further, and the next? What about murdering a corporate mass murderer? And what one minute appears to be a benign though provocative collective the next uncomfortably conjures a cult, one which practices arcane, symbolic rituals and recitations of its own on the one hand while decrying "the church" on the other. As ever, revolution is messy and bloody, and in something of a hairpin turn at film's end, Jane makes her own righteous choice, but the tacked-on way in which it's presented suggests bet-hedging in the editing room. Until then, The East (for all its familiar undercover-cop tropes) intrigues not with good guy-bad guy shtick, but with the conundrum of how to live morally in an inherently immoral West. Fox's special edition Blu-ray + DigitalHD release of The East features outstanding A/V quality and a smattering of bonus features. There's no complaining about the hi-def picture quality here, which is sharp, well-resolved, and accurate to the digital source material in color and contrast; it's not always a beautiful image, but it does reflect the filmmakers' intentions. The lossless DTS-HD Master Audio 5.1 mix is likewise definitive, but it won't overwork your system: rear channels aren't engaged as often or as dynamically as they could be (the environmental ambience is pretty mild), but the track is certainly clear and full where it most counts for this film: in the dialogue and, to a lesser extent, in the music. Four "Deleted Scenes" (4:46, HD) include an alternate ending. Theatrical Behind the Scenes comprises six brief featurettes: "The East Exposed: The Story" (3:08, HD), "Off the Grid: Creating The East" (3:10, HD), "Casting The East" (3:16, HD), "Two Brothers: Collaboration" (2:33, HD), "Cause and Effect: The Movement of The East" (3:08, HD), and "Examining the Moral Gray" (4:28, HD) a New York premiere post-screening Q&A with director Zal Batmanglij and star Brit Marling, moderated by Outliers author Malcolm Gladwell. 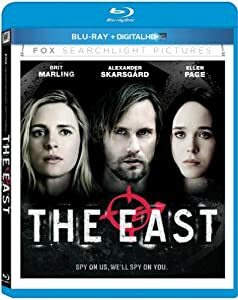 The first three featurettes here are Blu-ray-exclusive, and the interviewees include Batmanglij, his music-composing brother, and stars Marling, Alexander Skarsgård, Ellen Page, and Patricia Clarkson. Rounding out the disc are the film's "Theatrical Trailer" (HD, 1:07) and a "Sneak Peek" section (17:06, HD). This is a film that could have benefitted from a commentary or more lengthy video extras, but what's here is welcome for a bit of context. All site content © 2000-2019 Peter Canavese. Page generated at 04/25/2019 03:01:56PM.